After having my third child I was blessed with many meals from many friends. This was one of my favorites and I had to get the recipe from her. When she made this meatloaf, she made it with turkey and oh man was it delicious!!! You can use ground beef or ground turkey in this recipe and both are yummy. We pair this with chunky smashed potatoes and fresh red beets. Line a loaf pan with aluminum foil for easy serving and clean up. In a separate bowl combine ground beef, minced garlic, 1 tbsp Worcestershire sauce, milk, 2 eggs, salt and black pepper, dry onion soup mix, and oatmeal. Mix well with your hand and then add 1/3 of the brown sugar mixture. Pour enough of the brown sugar mixture to cover the bottom of the loaf pan. Add the meatloaf and top with the remaining brown sugar mixture. Thaw the night before in the refrigerator. Preheat the oven to 350, bake for 1 hour or until the meatloaf reaches 165 degrees on a meat thermometer. 1. Unroll dough on parchment paper. Place ham & turkey on dough leaving 1/2 inch to the edge; sprinkle with chopped onions, & cheese. Thaw Stromboli, unwrap from aluminum foil and discard foil. Leave parchment paper on cookie sheet, then Bake at 350 for 26-30 mins. or until golden brown. Cool slightly before slicing; slice into 2 to 3 inch pieces. Serve warm. NOTE: I doubled this recipe to feed 6 adults. Spray crockpot with non-stick spray. Add meat, vegetables and pineapple to crockpot and pour the bottle of Island Soyaki on top. Cook on low 6-8 hours or high 4-6. Serve over a bed of rice. Rinse rice under cold water. Place 3 cups water in sauce pan and bring to a boil. Add rice and bring to gentle simmer. Cove rice and turn heat to low. Cook 18 minutes. Remove lid and fluff with a fork. You can also throw all of the ingredients into a large bowl and then place ingredients into a large freezer bag or container. When ready to use, put in refrigerator and thaw overnight and the next morning fill the crockpot and cook on low for 6-8 hours. I got this recipe from the Kraft food magazine I used to get (when it was free). Our family LOVES this grilled chicken. 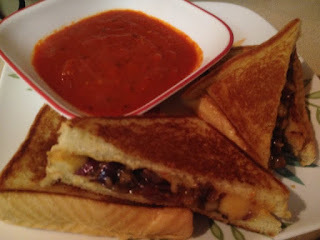 I have made this and taken it camping for an easy dinner. I froze it in a large plastic container, threw it in the bottom of cooler (still frozen). It thaws while helping to keep everything else cold that's on top. FYI, it probably won't thaw that same day. 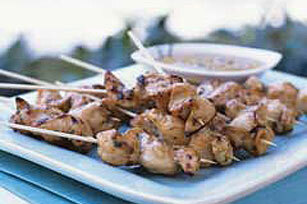 Soak skewers in water while making the marinade and cutting the chicken. Mix the first 6 ingredients (everything but the chicken) in a bowl and whisk until blended; set aside. Thread the chicken on the skewers; I filled my skewer. Place in foil pan (9x13 size). Pour marinade on top. Cover and freeze. Thaw completely in the fridge. The chicken will marinate while it thaws. Grill 5-7 min. or until chicken is cooked through. One day I went to Panera Bread with friends and tried their tomato soup and I was in love!! The problem was I can't recreate a dish (I wish I could), so I began searching online. I ran across this recipe on FoodandWine.com and thought it sounds hearty and delicious. I made this adding extra vegetables and haven't turned back! I make it in big batches and freeze it in portions my family will eat. I pair this with a chicken parmesan grilled cheese or grilled cheese with roasted mushrooms and onions smothered in smoked chipotle Gouda! Chop the onion, carrot, celery, and garlic cloves. Melt half of the butter in a large stock pan. Add the vegetables, continue stirring until soft and brown, but not burnt. Add flour and stir for about a minute until the flour is fully incorporated. Add the broth or homemade chicken stock, roasted tomatoes, tomato paste and sugar. Bring to a boil, then lower the heat and cover until vegetables are soft. Once the vegetables are soft, use an immersion blender to blend to the consistency you desire. I prefer on the chunky side, so I blend less. Continue blending if you prefer smooth. Lastly, add the heavy whipping cream, 2 TBSP butter and salt and pepper. Thaw in a bowl in the frog overnight. Place in a sauce pan and bring to a simmer to reheat and ENJOY! If you think last minute I want Tomato Bisque, place the bag in cold water to help quickly begin the thawing process enough that it can be broken into chunks. In a sauce pan, add enough water to cover the bottom, place the chunks in, cover with a lid. Stir occasionally until its thawed and warmed through, then ENJOY!